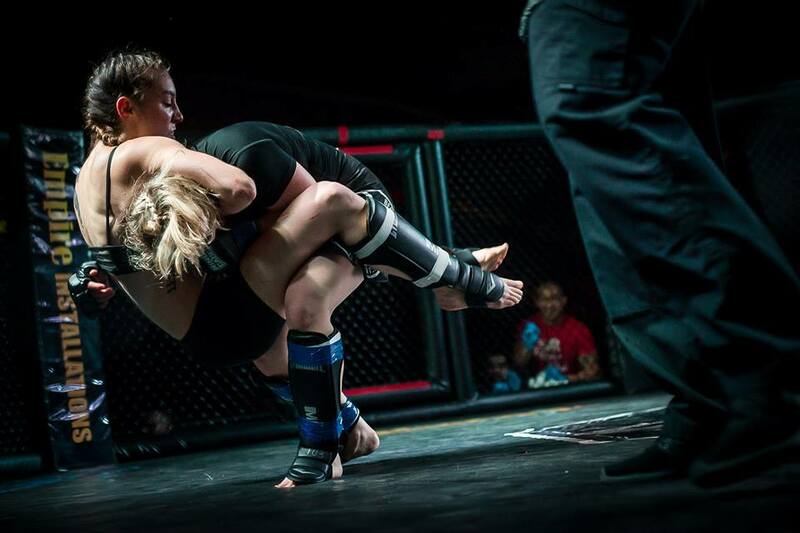 Alexandra Ballou choking out Tiffanie Ethington at Cage Wars 34. Alexandra Ballou flexing after her MMA debut win at Cage Wars 34. 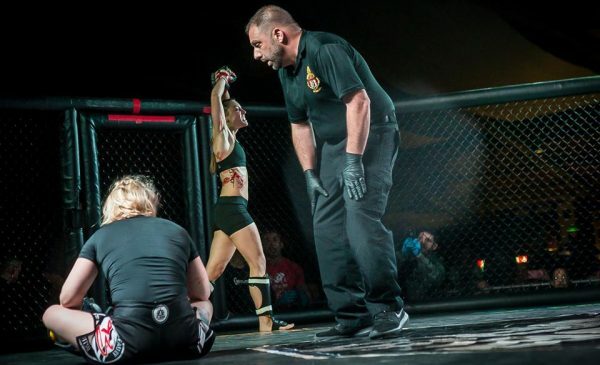 Alexandra Ballou, a native of Connecticut, won her mixed martial arts debut Saturday night at Cage Wars 34. The event took place at the Washington Avenue Armory in Albany, New York. Cage Wars 34 was sanctioned by the United States Muay Thai Association (USMTA). Ballou entered the cage against fellow 125-pounder Tiffanie Ethington, who was also making her MMA debut. The bout streamed live on FloCombat.com PPV. In the third bout of the evening, Ethington (0-1) and Ballou wasted zero time to get acclimated. They immediately met in the middle of the cage and went to war. In under a minute of the first round of action, Ballou landed strikes to the face Ethington causing her nose to appear broken and start gushing blood. Ballou, towered over her opponent, having the advantage in size and reach. Throughout the majority of the first round, Ballou utilized her reach. Ethington though threw a firework into the crowd when she closed the distance with a powerful spinning back fist. Ballou shrugged off the heavy shot like a veteran. After defending a blitzkrieg of strikes by Ethington, Ballou worked her back off the fence to an eventual front headlock. Once she captured her foe’s head, Ballou jumped into a guillotine, dragging Ethington to the canvas, where she would eventually submit her opponent. Ballou (1-0), expected to fight a different opponent, took this bout on short notice. Fighting in a novice amateur rules bout, Ballou mentioned to MyMMANews.com how she stuck to her game plan and looked to force her to the ground where her strong grappling skills would take over. “I fell in love with it. It’s an obsession,” Said Ballou, while discussing her introduction into Brazilian Jiu-Jitsu. “It’s such a physical and mental learning process,”. Ballou trains out of Sole Fighters Brewster -World Gym. Which is located in Brewster, New York. In addition, she trains out of Evolution Grappling Academy. Ballou’s striking coach is Juliano Zanetti, a former amateur MMA Fighter. Ballou is a Blue Belt in BJJ. She talked about how her training with all males prepared her for her MMA debut. A couple of her training partners are Mike Palladino, Filipe Costa, Paul Ciatto and Matt Alioto to name a few. Ballou Connecting on a left strike. Ballou, 25, is focused on her MMA career. She’s scheduled to fight on the next Cage Wars fight card, which takes place in January. Ballou mentioned how she wants to turn her young amateur career into a UFC flyweight title. She is determined to continue training, gain experience and compete a few more times before turning professional. She mentioned within the next couple of years she’d like to leap onto the professional scene. At flyweight, a new division in the UFC, Ballou has the raw talent and body frame to be highly competitive on the next level. She showed a presence inside the cage most professionals don’t obtain. 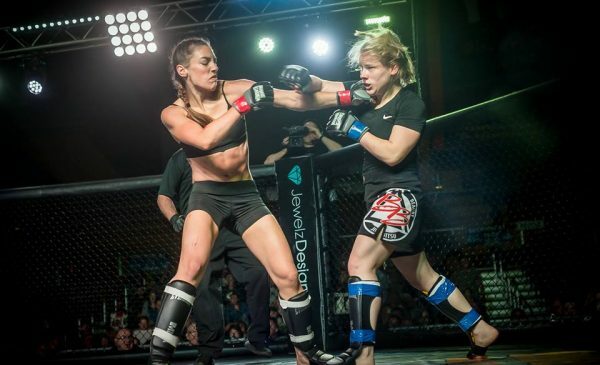 The Connecticut native’s poise, raw talent, and reach could be a distinct advantage for her in upcoming fights on the amateur scene. Her determination, mental fortitude, and ambition inside the gym will only help Ballou develop along her journey. Fight fans should keep their eyes on this young and talented fighter as she is set to climb the ranks. Expect to see Ballou on January 27, 2017, on the Cage Wars 35 fight card in Albany, New York. Opponent’s still to be determined. Be sure to follow Alexandra Ballou on Instagram at @aballs21. Follow MyMMANews.com on Social Media at @MyMMANews. Photo’s Courtesy of JTG Photo.